Mats Alvesson is Professor of Business Administration at the University of Lund, Sweden. Research interests include critical theory, gender, power, management of professional service (knowledge intensive) organizations, organizational culture and symbolism, qualitative methods and philosophy of science. Recent books include Understanding Gender and Organizations (Sage, 2009, 2nd ed with Yvonne Billing), Reflexive Methodology (Sage, 2009, 2nd ed, with Kaj Skoldberg), Changing Organizational Culture (Routledge 2008, with Stefan Sveningsson), Knowledge Work and Knowledge-Intensive Firms (Oxford University Press, 2004), Postmodernism and Social Research (Open University Press, 2002), Understanding Organizational Culture (Sage, 2002). 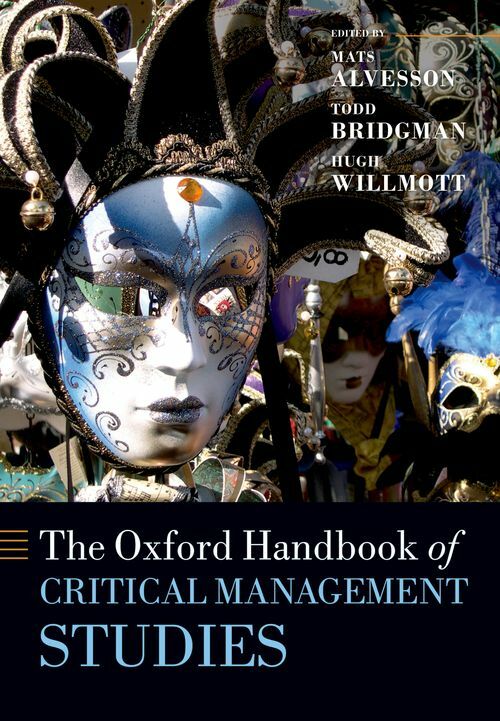 ; Hugh Willmott is Research Professor in Organization Studies, Cardiff Business School, having held professorial positions at the Universities of Cambridge and Manchester and visiting appointments at the Universities of Copenhagen, Lund and Cranfield. He has a strong interest in the application of social theory, especially poststructuralist thinking, to the field of management and business. His recent books include Critical Management Studies: A Reader (OUP, 2005), Introducing Organization Behaviour and Management (Cengage). He currently serves on the board of Academy of Management Review, Organization Studies, Journal of Management Studies, and Organization. ; Todd Bridgman is Senior Lecturer in Organizational Behaviour at Victoria University of Wellington, New Zealand. He was previously an ESRC Postdoctoral Fellow at Judge Business School, University of Cambridge and Junior Research Fellow of Wolfson College, University of Cambridge. His PhD, completed at Judge Business School, was judged best doctoral thesis in Critical Management Studies at the Academy of Management 2005. His research interests include poststructuralism, management education, and the role of the university in society. Todd is one of the founders of the CMS website http://www.criticalmanagement.org.